Used Suzuki Grand Vitara Review - 2005-2014 | What Car? 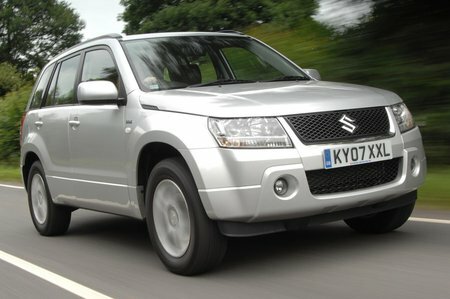 What's the used Suzuki Grand Vitara 4x4 like? When the original Suzuki Vitara was launched in 1988, it couldn’t have hit the spot more sweetly. It was a car that brought 4x4 motoring to the masses – and it was seriously trendy too. But trends move on, and for a while the Vitara – and its 1998 replacement, the Grand Vitara – looked about as fashionable as a pair of clogs. So in 2005, Suzuki released a new Grand Vitara with a heavy emphasis on style to try and win back the trendies. Inside, there was a fresh interior with smart styling and robust construction; while some of the plastics felt rather cheap and brittle, they were at least screwed together sturdily, and there was plenty of space for passengers. Under the skin, this Vitara had a car-like chassis, as opposed to the previous versions’ truck-like construction. As a result, it drove better than its predecessors ever did. But despite these soft-roader credentials, the Vitara was still capable in the mucky stuff, thanks to full-time four-wheel drive and, in five-door versions, a low-range transfer box, two bits of equipment most rivals skimped on. The trouble was, while rivals like the Nissan X-Trail and Honda CR-V couldn’t keep up off the road, they were much better on it. The Vitara was not a great car on tarmac. True, it handled well, with stiff suspension that prevented the body from leaning over too far in corners, as well as well-weighted steering and loads of grip. But that stiff suspension gave the Vitara an unforgiving ride that transmitted even minor bumps and imperfections through to its occupants. And both of the early petrol engines – a 105bhp 1.6-litre for the three door, and a 138bhp 2.0-litre for the five-door – felt pretty sluggish, lacking the mid-range punch needed to make overtaking a breeze. What was more, every engine – there was also a Renault-sourced 1.9-litre diesel, available only on the five-door – was noisy, and combined with the grumbling roar produced by the tyres, that made the Vitara a wearing thing to try to cover long distances in. A facelift in 2008 improved things somewhat, replacing the 2.0-litre petrol engine for a 2.4-litre unit that was both more powerful and more efficient. 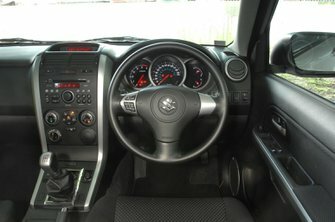 Suzuki also took the chance to smarten up the Grand Vitara’s interior and add more sound deadening to reduce the amount of road and engine noise; the ride quality, however, remained largely unchanged. As a used purchase a Vitara looks tempting today, and certainly, it’s one of the more entertaining small SUVs out there. But there are some big downsides in terms of comfort, cruising ability and performance – and it’s no cheaper than some more competent rivals.